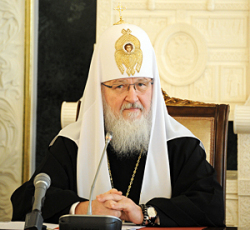 Moscow, June 25, Interfax – Patriarch Kirill of Moscow and All Russia has urged the believers to help those affected by the armed conflict in Syria amid the tragic events in the country. “I am asking you to follow Christ’s appeal and to help our close ones, namely those who currently need support and sympathy. I give the blessing with this purpose to organize money gathering to help those in need in Syria on nearest Sunday in all churches of the Russian Orthodox Church,” the Synod information department quoted the patriarch as saying in a special statement on Tuesday. The majority of the Syrian people is Orthodox and the center of one of the oldest Orthodox Patriarchates, of Antioch, is in Damask “and now human blood is flowing on the streets of this city remembering Apostle Paul and heroic deeds and labor of ancient saints,” Patriarch Kirill said. The patriarch said that on this biblical land, where Christians and Muslims lived side by side, relics are now being desecrated, churches are being violated, Christians are being forced out of their homes, being haunted and often tortured and killed. “Our people have recently lived through something similar. Thousands of our fellow citizens were killed during the revolution, civil war and persecutions against the Church. We should not watch indifferently how innocent blood flows again now. We can not stop this war but we can pray diligently for it to stop as soon as possible and to help people in need, including our Christian brothers,” the patriarch said. The money gathered in all eparchies of the Russian Church will be transferred to the Synodal Charity Department, which is responsible to coordinate the money gatherings, and then will be given to the Patriarchate of Antioch.